These tasty oven baked treats are a great size to be used as a treat or reward. Colourants; Nutritional Additives (Kg): Vitamin A 5000iu, Vitamin D3 500iu, Vitamin E 30mg, Ferrous Sulphate monohydrate 66.6mg, Zinc sulphate monohydrate 57mg, Copper sulphate pentahydrate 20mg, Manganous Oxide 4.83mg, Sodium selenite 1.11mg, Calcium Iodate Anhydrous 0.79mg. Toy (up to 5kg) = 3 biscuits per day. Small (6-10kg) = up to 7 biscuits per day. Medium (11-22kg) = up to 14 biscuits per day. Large (23-35kg) = Up to 21 biscuits per day. 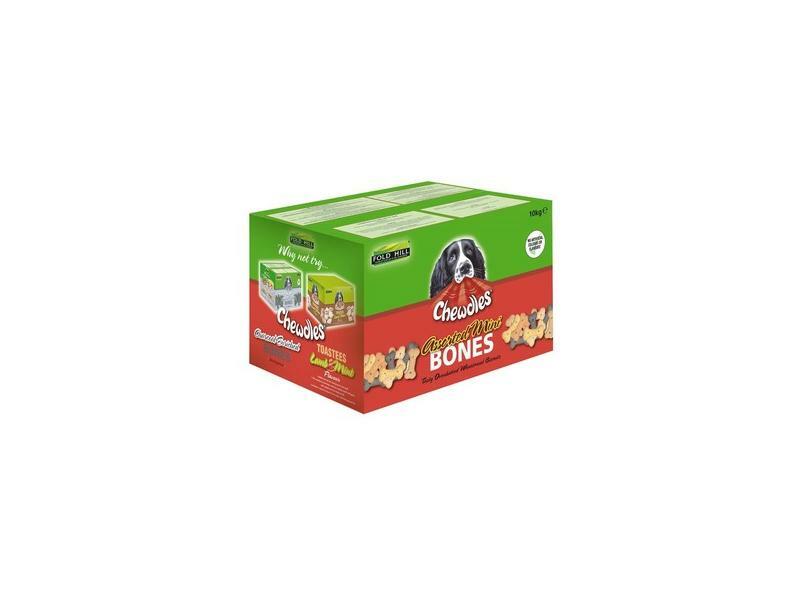 There are currently no questions for Fold Hill Chewdles Assorted Mini Bones - be the first to ask one!